Welcome to the next Round Robin. I enjoyed doing the first one so much that I thought I would start the second one up! Anyways, there are only two rules that I can think of. 1. Please make all story contributions in bold, and non-story conversation in normal text. 2. Please limit story postings to once a day. That gives everyone a chance to contribute. Also, if someone posts, and another story contribution isn't posted in a week, the last poster has the option to post the next story contribution to add to his last contribution. Anyways, have fun, and as I mentioned when I first joined, I am terrible with introductions. So I'll let someone else start. Maybe something Christmas-y to reflect the holiday spirit. I forgot to elaborate about something in rule 2. There can be more than one story contribution, I just meant one story contribution from each person a day. I didn't want an exchange in which two people posted five contributions a piece in one day. I made that more for myself, because I'm always tempted to move ahead in the story. Sam felt a new reality form around him, he didn’t make out any clear shapes yet, but the ground under his feet seemed quite solid and the scent in the air was familiar. In his mind the puzzle came together very quickly. He was on a farm. No doubt. His senses still available and alert should he need to adjust to anything unexpected, didn’t show any sign of it. He was looking out unto a vast countryside landscape on a warm sunny day taking a lungful of fresh air mixed with farm smells and enjoying it immensely. He had something in his hands though, warm and fluffy. And it – ouch- just clawed him. As he looked down, a terrified ginger kitten squeaked in panic and clawed him again, this time leaving two marks and escaped. Said a very caring and certainly well intentioned female voice behind him. Startled to be called by his own name, Sam turned around. He saw a middle aged red and ruffled-haired lady in simple, but pretty clothes that had seen better times, sit in a rocking chair. She was extremely charismatic and radiated a wisdom and confidence past beyond her years. The kitten was curled up in her lap and was being affectionately caressed. While he woman’s attention was completely on the kitten, the feline was eyeing Sam suspiciously. Sam’s first thought at the sight yelled ‘witch!’ then he berated himself for stereotyping, he of all people should know better. His second thought was that ‘Sam’ must be the kitten. Sam (not the kitten) tried to compose some kind of question, and as he was thinking he heard a few very fast ... paw steps and panting. Trying to turn around to take a look had probably been a mistake because he was promptly knocked clean off his feet in mid motion by… one, two - the ground could be hard if you didn’t expect to land on it – three? .. Sam lost track of the excited dog pack. Contrary to the cat these guys seemed positively happy to see him and decided to doggy pile or alternatively lick him into submission. Trying to wrestle his way up against two .. possibly German Sheppards he could get hold of, he heard a very loud and good humored laugh. Another dog got a good lick of his ear that brought him straight out of concept and back on the ground. Sam finally was able to sit up, although the dogs continued to lick him. He could see their tails wagging, and Sam had a feeling that he had a good relation with the animals. "I think the dogs are happier to see me than the cat is," Sam laughed. "For a lawyer, you're still pretty good with animals," the lady responded, prompting Sam to look at what he was wearing. It didn't dawn on him until now that he was wearing a gray suit, and he just got it dirty. "Well, some things you never lose," Sam responded, trying make his answer as vauge as possible. "Of course you are. I remember once when you were six-years-old, and Rocky, the meanest pitbull the Lord placed on this Earth, came up to you and curled up in your lap like a kitten." Sam stopped for a moment, wishing he could excuse himself and find out his relationship with this woman, why he wearing a suit on a farm, and what he was supposed to do. Brushing some of the dirt off "his" suit Sam straightened his back. Sam smiled at the woman. "I remember that," he lied. "I'll bet it shocked everyone." "It did indeed!" The woman laughed. Sam decided that he would use his most common excuse, one that would always guarantee a little bit of privacy. "Excuse me. I have to use the bathroom," Sam said, walking towards the hosue. "Don't make a lot of noise. Your grandfather's sleeping, and you don't want to disturb him," the lady responded. Sam nodded, and walked in the house. It was very quiet, and pretty empty. Everyone else had to have gone, except for the grandfather and the woman. He made his way to the bathroom, and shut the door. "Al? Any time now would be good," Sam whispered. Through the door Sam could hear the loud sound of snoring. It sounded more like someone was shifting gears up and down the highway... The temptation to find the person to throw pillows on them was rather strong. But Al wasn't forthcoming. What was taking him so long? Sam made use of this chance take look at the bathroom mirror, while his brain was analyzing the details he'd seen on the way and the objects and decoration of the bathroom. From what he rememberd from past Leaps this seemed like late 50ies, early 60ies, or this could just be rather quaint people. Yep, definitely family resemblance, Sam thought as the reflection of a red haired lawyer stared expectantly back at him. What bothered him most, though, had to be the snoring. He couldn't hear it when it when it first came in the house, but now he could hear it much more loudly than he wanted to. 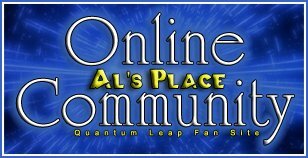 Finally, when he thought he couldn't take it any longer, he could hear the door that Al used from Project Quantum Leap open, and in a moment, Al was in the bathroom with him in a very festive green suit. Sam raised an eyebrow, "You look like a St. Patrick's day reject." Al tried to look angry but had to smile. "Hello to you too." He paused long enough to hear the sound of the snoring, "What's that noise?" "'My' grandfather is sleeping," Sam replied. "Al, what am I here to do?" St. Patrick's day reject! COOL! You know, I've noticed that there's not a lot of interest for this Round Robin, and that includes myself. Just thought I would mention that, if someone enjoyed writing and wanted to contribute. "Well, Sam, Ziggy uh doesn't have much data..."
"Oh, just for a change!" Sam shot back, frustrated. Why couldn't the computer just give it to him straight for once? "Can you at least give me a name? And don't try telling me it's Ginger." "Ha, good one Sam. You've leaped into a lawyer..."
"Ahead of you on that one, Al. Now tell me something I don't know!" "Well actually, I bet this guy got called Ginger at school. Not only because of the hair, but his name is Gerry Rogers. Ginger Rogers, geddit?" Al chortled, wagging his cigar. Sam just rolled his eyes. Sam tried to think of a way to get at least some kind of information out of Al. "Alright, then could you at least tell me why there is no data on Ginger"
Sam winced now he was doing it too, he felt like he had somehow run into Al's 'trap' and tried to recover as smoothly as possible. Al in turn grinned victoriously. Sam waited it out for a few seconds, admitting to feeling silly and going from there. "What's up with Ziggy, Al? There's some data, right? At least give me the year." Ah. I'll try to add something to it this evening, when I can do my best thinking. all right I am new to this so bear with me.“Hang on a minute Sam I think I’m getting something” Al responded. Sam looked at all and noticed the bright lights of Ziggy’s communicator lighting up. “ The date is August 25th 1963. You are in Farmington New York. The old man cutting z’s in the other room is Buford Rogers... Buck for short, hah that’s kind of funny and the lady you saw on the porch is your mother Victoria” “All right I got the who, and the where. I just need the what and the why” Sam said.“er the why?? Sam” Al asked perplexed“Yeah why my ‘grandfathers’ nickname is so funny”Al couldn’t help smiling “Man even your swiss cheesed mind should know the answer to that…Buck Rogers the space traveler.” Back in his mind Sam had a vague memory of the name but quickly pushed it aside.“Anyway, why am I here Al?” Sam asked getting slightly annoyed.“Well we haven’t quite figured that out yet Sam” Al hesitantly explained“Well, go back and tell Ziggy to get on the ball and don’t come back till you have something to tell me.” Sam said quite annoyed by the lack of info coming through. Al realizing that Sam was not in quite the best mood punched some buttons as the imaging room door opened up behind him. “All right Sam I get some info. In the meantime go relax and take that edge off a bit sheesh” As soon as Al was gone he immediately felt bad at his harshness towards his friend. “ I shouldn’t have snapped at Al like that” Sam thought. “ I just get tired of leaping every now and then and it just gets frustrating, I am going to have to apologize to him when I see him again.” Well, there you go my first ever submission to a round robin/ quantum leap story hope it was worthy I know the submissions need to be in Bold face but my browser for some reason isn't allowing it. Sorry. Last edited by leaper1; 01-16-2009 at 05:18 PM. all right my browser is really messing this whole thing up. I know it is suppossed to be in bold face but for some reason I can' t get it to work right. Sorry about that. That's alright. After all, if you can't put something in bold, then you didn't do anything wrong. It's just nice that you contributed to the story, something I've been lacking in lately. Thanks for the next story part, Jaycol! After Al left, Sam actually did use the bathroom. When he was done, he washed up and went back outside to see his hosts mother. "Mom, are you thirsty? Can I get you something to drink?" "Some of that sweet Ice Tea in the fridge would hit the spot quite nicely. Thank-you honey." Sam walked into the kitchen and found a couple glasses in the cupboard above and to the right of the sink. He put them on the counter and walked over to the fridge and got some ice out of the freezer and put it into the glasses. He then filled both glasses with the ice tea and brought them out to Victoria. He handed her one and then sat in the rocking chair next to hers. "So how is everything mom?" Just for the sake of clarity, I've used my mod rights to embolden the post made by Jaycol. I sometimes have trouble with the bold option if I use my PC at work, but it is fine here at home on my Mac. Alright, here it is. By the way, I love the Buck Rogers joke. "Well, not so well since you left," Gerry's mother replied. Sam lifted one of his eyebrows. Perhaps, and he was probably hoping for too much, Victoria was going to tell him what the problem was, and Sam could get a head start on it before he would have to wait for Ziggy. "Oh, it's your first day back here in three years. I don't want you to worry about what's going on over here. I want you to relax, catch up with all your old friends, and spend some time with your family. Don't worry about us." Sam knew that he had to get what was wrong out of her, and fast. He wanted out of here, partially so that Gerry could could be the one to catch up with his old friends. "Come on, Mom, I won't be able to relax until you tell me what's wrong." Victoria sighed. "Alright. Here it goes. We may lose the farm." Sam gasped. That HAD to be why he'd Leaped in. The memory of his own folks losing the farm he'd grown up on came back to him clearly. He knew how much it had meant to his family, and he knew of others who's homes and livelihood had been taken from them. Like the brother's who'd tried to rob the bank to pay off their bank loan in a previous leap. What was their name? He couldn't recall, due to his Swiss cheese memory. But he did remember being determined that he would help them save their farm. He was just as determined to do the same thing here and now. "Not if I can help it, mom," Sam promised the woman beside him. Victoria smiled kindly at her son, "There you go again thinking of everyone else before you think of yourself." Sam smiled sheepishly and shrugged, "It's my job Mom. As soon as I can I'm going to do all that I can to keep us from losing the farm." "And what exactly do you plan to do?" Victoria's face bore more amusement than any sarcasm. "Start by telling me what's wrong and what can cause you from losing the farm." thanks Leaper1 just so you are warned you may have to do it again as this is the only computer I have access to and all my posts will be like that.